The modern day mobile phone is often referred to as the 'smart' phone. 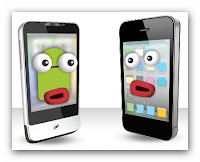 At the top of the list is the iphone with Android handsets becoming increasingly more popular. But are they really smart? Let's listen in on a random conversation in the video below. This animation features one of the quick templates in GoAnimates latest Type a Video theme, Talking Picz. The theme is a departure for GoAnimate as it uses templates and talking faces unique to the theme i.e. you can't access any of the backgrounds or faces in the GoAnimate Studio. I'm still not a big fan of the Type a Video themes. No matter what I make I can always see how I could improve it if I could just edit it myself and add my own custom sounds, voices etc. However, as I've said previously, they are a great way to get down a quick idea for a bit of fun - such as I have done in the video above. Give them a try if you have a talent for writing comedy and just need a quick way to put your words into a visual performance.